Municipal utilities are not immune to natural disasters. 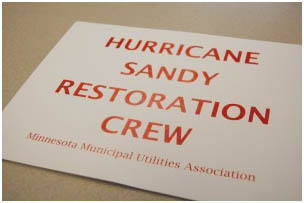 In fact, a list of communities devastated by recent floods, tornadoes and ice storms includes many MMUA member cities. We never know when disaster will strike, but we do know it is only a matter of time. MMUA staff has gained a tremendous amount of hard-won experience over the years in responding to natural disasters. When disaster does strike, MMUA staff is prepared, at a moment’s notice, to come to your community to assist in the process of rebuilding your facilities. MMUA can organize and oversee any aspect of the mutual aid effort, allowing your staff to concentrate on the tasks it will need to focus on in a disaster recovery. To gather and maintain timely mutual aid information MMUA has partnered with Veracity Connect, Several statewide municipal associations have already partnered with Veracity. Veracity’s secure and easy-to-use online program—called Veracity Connect—makes it easy for members to update information. Updates can be made anytime, from any device. MMUA asks its members to activate their Veracity account. For your reference, we include a handy guide here. Your account information will only be used by MMUA for a mutual aid event. After your initial account activation, we ask that you periodically log in and review/update the information to ensure it is accurate. If you have any questions or concerns, please contact Mike Willetts, director of training and safety, at 763-746-0705. We thank you for helping us help you respond effectively to mutual aid situations if, and when, they occur.